Curb Ramp™ is a DIY rubber driveway ramp for lowered cars. Affordable and easy, this steep driveway solution is perfect for getting over rolled curbs. Got Curb Ramp a few weeks ago and installed it this past Sunday. So much smoother! Thanks! My neighbor tried filling in their curb with concrete about two years ago and now it’s crumbling all over the place. This stuff looked like it would hold up well and it does! My neighborhood has round curbs so I have to be extremely careful every time I enter and exit his driveway with my low ride height. I looked at a few pre-made rubber ramps, decided I didn’t feel like dropping $400, bought some Curb Ramp and installed it myself. They included gloves and brush and everything except the trowel but well worth it to save $200 if you ask me. A good product and really a great company to do business with. I’ve ordered Curb Ramp on 2 separate occasions. The first to fill in my driveway curb, the second to patch a hole in my cul-de-sac. So far this stuff holds up really well on both accounts. I would recommend this product in both situations. I was tired of scraping my van when I backed out of my driveway so I ordered Curb Ramp and paid my neighbor’s kid to install it lol. Works great! A simple DIY solution that’s easy to install. Most curb ramps I’ve come across are ridiculously expensive so I was wondering if there were any cheaper solutions out there. I found this product on Google and called them up and talked to them about my driveway situation. They did the math and assured me that two kits would be enough. The material was easy to shape to fit my curb and looks really good! My wife loves it and my Benz does too :) The Curb Ramp guys followed up two months later to make sure I was satisfied with the ramp. That kind of customer service is rare! 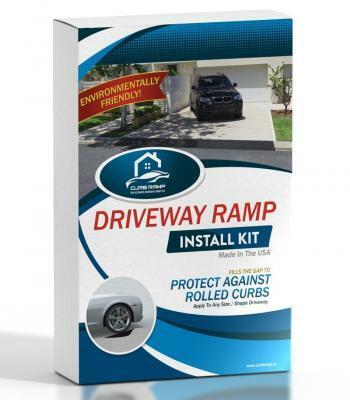 Curb Ramp lets you go a lot faster in & out of your driveway without rattling your fender. That’s why I got it. - Parker F.
I go to the same gas station several times a week on my way to work. The main entryway is a disaster! I’m leasing a 2014 Toyota Camry and trying not to mess it up, but my car would scrape on their curb every time. I told the owner I would fix it for $400 and he said ok lol. So I bought a couple boxes of this stuff and went out there one afternoon and laid it down with PVC underneath for drainage. We blocked off that entrance overnight and the next day it had dried and the transition was so much smoother. He said customers have been thanking him for fixing it. I’m thinking about turning this into a side business to make some extra dough on the side! I used to cringe every time I backed out of my driveway because I knew the scrape was coming.. I bought Curb Ramp and had my husband lay it down ;) He said it was a piece of cake! It works great and I’m just glad I don’t have to worry about messing up my new car every time I leave for work and come home -- highly recommend!